The Results of an "Awakened Kundalini"
Hatha Yoga... Mere Physical Exercise, Or Steps To An Awakened Kundalini? Part IV... Is Kundalini a Blessing or Curse? Summary... A New Thing? You Have To Be Kidding! PART V .... Yet Fools Still Rush In Where Angels Fear To Tread. In order to understand what this spiritual power is in Hinduism and how it is conferred, it is necessary to have a basic grasp of three inseparable concepts... Chakras, Kundalini and Shaktipat. The terms come from Sanskrit, a classical language of India, and the primary liturgical language of Hinduism used, for example, in worship and yoga. Chakra is the Sanskrit word for 'wheel' or 'disk'. Ancient Indian/Tibetan tradition and philosophy holds that there are seven Chakras, or energy centers in the human body. These are often depicted as non-physical circles of energy, spaced at intervals along the spine, from the base to the crown of the head. According to the ancient yoga system of India, Chakras have a large influence on the physical human body. International author Anne Lewis is one of Australia's best-known and respected Yoga teachers who runs Tibetan Rites workshops in Sydney. In an article on the website of the an-Ahata School of Universal Yoga, she says ..
...Chakras are often referred to as lotuses, for they open and close like a flower and, in Tantric Yoga, they are shown with a varying number of petals. The petals range from four at the base chakra to one thousand or more at the crown. Contemporary spiritual literature often notes that the chakras, as described in the esoteric kundalini documents, bear a strong similarity in location and number to the major endocrine glands, as well as nerve bundles called ganglions” . Many believe that our health is directly influenced by this life force, which has resulted in many different forms of energy healing. However, the concept of kundalini has taken the whole idea to an entirely different level. Kundalini has been described as a concentrated form of prana or life force, associated with the goddess Shakti, said to be the energy giving power behind all creation. In Hindu tradition this Shakti which lies dormant in our bodies, is conceptualized as a serpent coiled three and a half times around the lowest chakra, at the base of the spine, awaiting unfoldment (in Sanskrit, kundalini literally means that which is coiled). When 'awakened', this goddess kundalini is said to awaken and unfold each chakra as she ascends through the spine, ensuring the free flow of life energy (prana or qi) throughout the body, thus balancing the chakras and promoting general health and well-being. When she has risen to the crown chakra, located at the top of the skull and associated with elevated spiritual consciousness, then all chakras have been opened, and a person is said to experience enlightenment. I find it particularly interesting, and very alarming, that numerous articles on kundalini, refer to it as an 'intelligent force'. All of the above may seem to you, as the reader, to be rather bizarre, rather far fetched, even freaky, supernatural gobbledygook from the heart of a religious tradition that is notoriously difficult to understand. 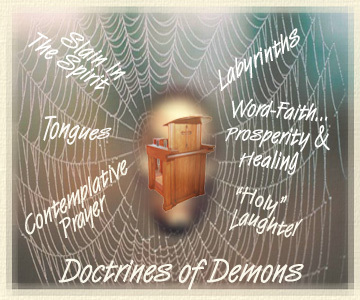 And you may be wondering what in the world any of this has to do with what you have experienced in your 'church'. Stay with me, because this is where is it gets truly alarming. What follows are facts that, tragically, most Christians are dangerously unaware of. The 'awakening' of the kundalini can be achieved through three main practices, the most effective of which are meditation and yogic postures such as those taught in Hatha Yoga, or a guru or spiritual teacher conferring the spiritual "power" or awakening, often by means of a touch to the forehead. Please note: There is more about Yoga asanas and Kundalini in Part III below. Which bring us to the third Sanskrit word... Shaktipat, derived from two separate Sanskrit words.. Shakti and Paat. As previously mentioned, Shakti is strength, psychic energy, or life force, while Paat means to fall or descend. In other words, Shaktipat is the descent of grace, or transmission of energy, from one person to the other. "... the short cut to an awakened kundalini is through a Guru, or so called holy man, who can transmit energy to an aspirant and awaken the kundalini, which brings about an expanded states of consciousness. This is often done by touch to the ajna chakra or the disciple's third eye. You did get that? The fastest, easiest way to awaken kundalini is with a touch to the forehand, or the recipient's 'third eye'. Does that sound at all familiar to you? But there is more... much more. The end results of an awakened kundalini are many and varied. "The ascent of the Kundalini as it pierces through the chakras is manifested in certain physical and psychic signs. Although she apparently leaned towards the mystical, read what Welsh evangelical speaker, Jessie Penn-Lewis, said close to a century ago, in Chapter 6 of her book entitled War on the Saints, written to combat the deception that arose during the 1904-1905 Welsh Revival. Rajneesh lived in opulence, earning the nick name the "Rolls-Royce guru" due to his large collection of Rolls-Royce automobiles. However, his followers existed at mere "subsistence level", most having severed ties with friends and family and donated all or most of their money and possessions to the commune. Rajneesh was eventually deported from the United States after it was revealed that the commune leadership had committed a number of serious crimes, including a bio-terror attack (food contamination) on the citizens of The Dalles. Denied entry by twenty-one countries he eventually returned to Pune, where he died in 1990. "just be joyful . . . God is not serious . . . this world cannot fit with a theological god . . . so let this be your constant reminder – that you have to dance your way to God, to laugh your way to God" (p. 229). And, Indian gurus are not the only ones to view extended periods of laughter as a spiritual experience. However, note that God has never ever said, or even indicated, that we will achieve any kind of union with Him. Adoption as children... yes! Union ... No! But what has all this to do with practicing Yoga to achieve bodily strength and flexibility? However, it is not only by Raja Yoga, that "godhood" is said to be achieved, but the more common Hatha yoga, often perceived as mere physical and relaxation exercises that make enormous changes in the body. In other words, Raga or Ashtanga yoga, begins where Hatha Yoga leaves off, and the asana is but the beginning of the journey. Yoga works systemically to alter biochemical functions, including our hormones and endocrine system. The so-called physical activity in Hatha Yoga is meant to achieve a changed state of consciousness, eliminating the distinction between subject [self] and object. Yoga is designed to gradually disconnect one's thoughts and sensory perceptions from one's sense of self and identity. The Integral Yoga magazine (online) says although asanas are postures designed to develop physical health and flexibility, they "play an important role in Raja Yoga"
Asanas, more prominently work to redirect the vital energies and kundalini towards the crown of chakra. Asana are done as steady and comfortable physical postures. Asanas have become a popular way to maintain proper health for the contemporary mass. However, they were not initiated just to tone muscles or keep joints supple; but were designed to help in the union of the individual self with the divine. If practiced properly, asanas can bring kundalini to the crown chakra and help in merging the yogi’s consciousness with the divine consciousness of the Divine. Legally and morally, I have to tell you: "Fools rush in where Angels fear to tread." kundalini has been called the most powerful force in the universe. Respect it, or it will kick you to pieces. I don't think kundalini itself, kills anyone but resistance to the process can result in trauma that moves people to suicidal behavior. Don't seek awakening unless you are genuinely ready to turn your whole life over to your Higher Power, have it taken from you, and reshaped, redirected and rebuilt. "Not my Will, but Thine be done." kundalini eats your ego based free will, replaces it with the will of your Soul. This is a door that once opened, does not close again. There is no putting the Genii back in the bottle. "... Durga the creatrix, Chandi the fierce and bloodthirsty, and Kali the destroyer. She is also Bhajangi the serpent. As Chandi or Kali she has a garland of skulls around her neck and drinks human blood." The fact that Hatha Yoga practices can lead to insanity is widely known in India and, to some extent, even in the West. For thousands of years gurus have operated with gifts of healing, miracles, gifts of knowledge and intense displays of spiritual consciousness. For thousands of years they have connected with a cosmic power which, though demonic in origin, is very real. For thousands of years devotees have gone forward to receive spiritual experience (Darshan) from a touch by the open palm of the hand, often to the forehead, by the guru in what is known as the Shakti Pat or divine touch. For thousands of years the manifestations of an awakened kundalini among people of other religions has been exactly the same as the results of being 'Slain in The Spirit' in so called Christian meetings. In short, the modern phenomenon of "slain in the spirit" has absolutely nothing to do with the Bible, but is rooted in the ancient practice of awakening the kundalini through Shaktipat. Not convinced? They say a picture says a thousand words... In which case this video, comparing the spiritual manifestations of other religions and the new false revivals taking place inside the church, has to be worth at least a million. When "kundalini teacher" said that he was legally and morally bound to issue warnings about kundalini, he also used the phrase "Fools rush in where Angels fear to tread". And he is right. Many thousands of Christians are rushing into spiritual quicksand, experimenting with Yoga, Contemplative prayer and even kundalini directly. However, by our actions, we make it very clear that we do not think Jude had any idea what he was taking about. Or perhaps that his words were far more suitably applied to the rather naive lot in the first century. We seem to believe ourselves to be altogether too smart to fall for any form of subterfuge or duplicity, being, after all, on the cutting edge of a new world.. boldly going where no man has gone before...well equipped to fine tune our spirituality and raise our awareness, along with the global consciousness of the planet. [See Overview of the New Age] Note: The link points to part II, but I strongly suggest you read all three sections in order. When innumerable practitioners of Kundalini warn that this so called "awakening" is not without extreme dangers, what in the world makes Christians think they can practice yoga, indulge in Contemplative prayer, etc and not be influenced by the very real serpent power behind these practices? I don't know about you, but this makes me very, very uncomfortable. An "abyss" is spoken of a few times in the New Testament... always in a very negative light. The king of the abyss is called Abaddon which literally means "destruction" (Revelation 9:11). The demons who possessed the man from the country of the Gadarenes seemed very fearful of the abyss and implored Jesus not to send them there (Luke 8:26-33). The beast comes out of the abyss in Revelation 11:7. The angel who holds the key of the abyss throws the dragon (the serpent of old) into the abyss for a thousand years. Now I do understand that St Romain felt like he was going down into an abyss, but considering all the very terrible things that can and do happen connected with an awakened kundalini, and the fact that all this is associated with a very ancient goddess who is also known as the destroyer, it is more than likely that this was indeed an abyss, especially since there is simply no way anyone can associate the God in whom we have put all our trust, with black holes. Over and over again, the Bible tells us that God is light, and provides light. 1. Don't panic! Fear only colors the energy darkly. There is nothing to fear if you cooperate with the process (or at least don't frustrate it too much). And he would have us believe that this is of God? In Scripture there are several references to people being told NOT to fear.. not because 'the energy would be colored darkly', but because God goes out of His way to reassure them that they have nothing to fear from Him. The words of David are especially telling, especially those underlined.. No darkly colored stuff here. "In order to guide persons having this experience, Christian spiritual directors may need to dialogue with Eastern teachers in order to get a fuller understanding. 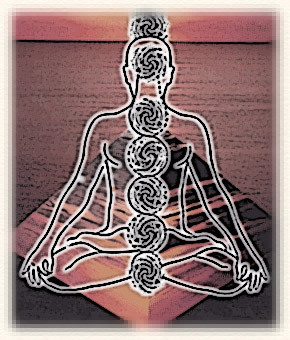 Although kundalini is mainly associated with Hinduism, it is related to several other occult practices like Qi Gong, and is thought to have parallels in many of the mystical and gnostic traditions of the world's great religions like the ritualized dhikr ceremonies, the Whirling Dervishs of the Sufis and the Tummo practices of Tibet. Kundalini is a prominent practice in Japan's Aum Shinrikyo group [notorious for the 1995 sarin gas attack in the Tokyo subways] and Shamanistic practices in Ayyavazhi (also a Hindu sect). African Kung Bushmen Of The Kalahair. The Grofs, in their book The Stormy Search for the Self, also cite an interesting parallel between the kundalini awakening and the trance dance of the African Kung bushmen. During rituals the bushmen "enter a profound altered state of consciousness associated with the release of powerful emotions such as anger, anxiety, and fear. They are often unable to maintain an upright position and are overcome by violent shaking. Following these dramatic experiences, they typically enter a state of ecstatic rapture. According to the bushmen tradition, the dance releases from the base of the spine a cosmic healing force called ntum or 'medicine.' This is then passed by direct physical contact from one person to another." Subud is an international spiritual movement that began in Indonesia in the 1920s as a movement founded by Muhammad Subuh Sumohadiwidjojo, the basis of which is a spiritual exercise commonly referred to as the latihan kejiwaan, which was said by Muhammad Subuh to represent guidance from "the Power of God" or "the Great Life Force". The central practice of Subud is the latihan kejiwaan (literally "spiritual exercise" or "training of the spirit" or simply 'the latihan'. This exercise is not thought about, learned or trained for; it is unique for each person and the ability to 'receive' it is passed on by being in the presence of another practicing member at the 'opening' (see below). About twice a week, Subud members go to a local center to participate in a group latihan, men and women separately. The experience takes place in a room or a hall with open space. After a period of sitting quietly, the members are typically asked to stand and relax by a 'helper', who then announces the start of the exercise. In the practice of the exercise, members are typically advised to follow 'what arises from within', not expecting anything in advance. One is recommended not to focus on any image or recite any mantra, nor to mix the exercise with other activities like meditation or use of drugs, but simply to intend to surrender to the Divine or the transcendent good or the will of God. (The term "God" is used here with a broad and inclusive intention. An individual is at liberty to substitute interpretations that they feel more in tune with.) One is not to pay attention to others in the room, each of whom is doing his or her own latihan. During the exercise, practitioners may find that, in terms of physical and emotional expression, they involuntarily move, make sounds, walk around, dance, jump, skip, laugh, cry or whatever. The experience varies greatly for different people, but the practitioner is always wholly conscious throughout and free to stop the exercise at any time. 2. From ancient times down to the present, there is found among various peoples a certain perception of that hidden power which hovers over the course of things and over the events of human history; at times some indeed have come to the recognition of a Supreme Being, or even of a Father. This perception and recognition penetrates their lives with a profound religious sense. "... was a mercantile center with shrines to many gods, chief of whom was Ilah. The Ka'bah sanctuary in the city square guaranteed the safety of those who came to trade. The pre-Islamic deities of Arabia which were most venerated were astral deities, especially the triad of the moon god, the sun goddess, and the god associated with the planet Venus. The moon god was the chief and was protector of the cities. These deities were given various names, however the moon god was evidently originally the Babylonian moon god Sin. To end division among his people in Mecca, Muhammad elevated the moon god Al Ilah to the chief and only god. (It is not widely known in Islam that Allah was a sexual being, having fathered three daughters--this is documented in the E.B.). [The History of Islam]. The true God is not Allah, Krishna, Brahma, Buddha, or the gods of Joseph Smith, the Sikhs, or the Bahais. In fact, in the Scriptures, He went to great lengths to differentiate Himself from all the gods of the peoples and religions, forbidding them to have anything to do with them but, instead to tear down their altars, and smash their sacred pillars. Siddha Mahayoga FAQ. Version 2.0, May 1996. Copyright Kurt Keutzer, 1996. The Path of kundalini Maha Yoga by Shri Dhyanyogi Madhusudandasji. Meditation and Breath. Warren Smith. Holy Laughter or Strong Delusion. Ravindra Kumar, Ph.D. Kundalini Shaktipat Part 1. kundalini Shaktipat for Beginners. Warren B Smith. Holy Laughter or Strong Delusion? (Published in the Fall 1994 issue of the SCP Newsletter). [45a] Goddess Tours Greece-Sacred Sites Tour, Goddess Pilgrimage To Crete With Carol Christ. kundalini Yoga: Unleashing the Divinity Within. Teresa Bergen. Demand Media. Signs & Symptoms of kundalini Energy. Difference Between Hatha Yoga & Ashtanga Yoga. By Patricia | June 15, 2009. Copyright © 2014 Yogawiz.com. Raja Yoga: Eight Limbs Of Ashtanga Yoga. Copyright © 2003 - 2014 by Integral Yoga Magazine..
 Philip St Romain, kundalini Energy and Christian Spirituality... A Pathway to Growth and Healing. Philip St. Romain, kundalini Energy and Christian Spirituality: A Path to Growth and Healing, New York: The Crossroads Publishing Company, 1994, Page 125. Declaration On The Relation Of The Church To Non-Christian Religions. Nostra Aetate. Proclaimed By His Holiness Pope Paul Vi On October 28, 1965.